The air fern or Neptune plant is touted as a houseplant that thrives on neglect. It never needs water. It doesn’t even need light. No matter what you do, you can’t kill it because it’s not alive. In fact, it’s not even a real plant. Although the air fern resembles a plant, it’s actually an animal. Specifically, it’s a colonial animal called a hydrozoan, related to jellyfish and coral. 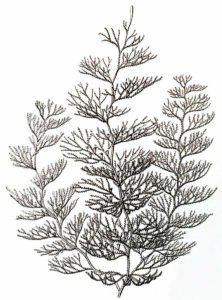 The most common species of hydrozoan used to make air ferns is Sertularia argentea, commonly known as the “sea fir.” Bryozoa or “moss animals” are also used. Most “air ferns” are picked up by trawlers fishing in the North Sea. The animals are dried so that only their fern-like skeletons remain. 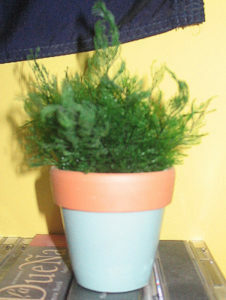 Those sold as decorative air ferns are dyed green. If these “plants” are watered, the dye will run. Sometimes Sertularia is left its natural color for use in an aquarium. These versions are called Neptune plants. Although the air fern is a fraud, there are plants that absorb water and nutrients through the air and the minimal substrate on which they live. However, these plants are not ferns. They belong to the genus Tillandsia and are bromeliads. Some Tillandsia species are epiphytes, which grow attached to other plants, but without soil. Others are aerophytes, which have no roots and absorb nutrients through their leaves. Spanish moss (T. usneoides) is one type of air plant. 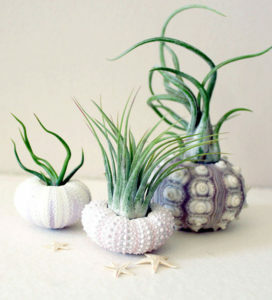 Others go simply by the name Tillandsia. They may be kept in open glass balls or shells. No watering is required, they do need light, they do grow, and it is possible (although difficult) to kill them.